The city of Cupertino hosts a daytime 4th of July festival in Memorial Park, beginning with a flag raising ceremony at the Veteran’s Memorial at 9:30 am, followed by the annual Children’s Parade which winds through Memorial Park and finishes at the Memorial Park Amphitheater. Following the parade, there will be a family concert and children’s Carnival in the park from 10 am to noon. 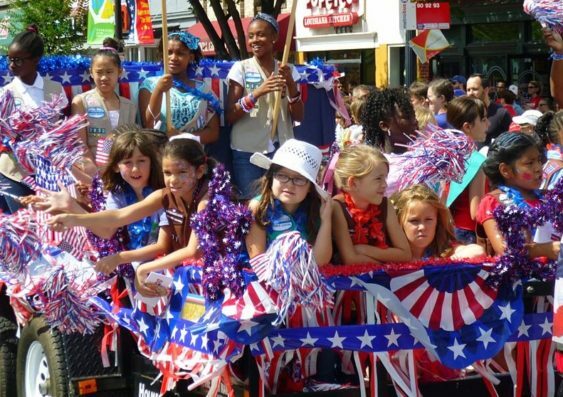 10 am: Children’s Parade – Wear your best red, white, and blue outfit. Decorated bikes, scooters, and strollers are encouraged. 10:30 am-Noon: Concert in the Park. Featuring the Music of The Cocktail Monkeys. Pack a picnic and enjoy the music.